The morning was rainy and dreary, with dense fog, but then the gloom lifted and now the sky is a brilliant, jewelled blue. The beautiful snowfall of just a few days ago is already soggy and disappearing fast. Winter appears to be losing strength right now. It’s still early enough in the season for cold and wintry weather to make a strong reappearance at some point, but it doesn’t look as though that will happen in the next week. The weather has changed so fast over the past few days that I discovered I had four different coats draped over the backs of the kitchen chairs, each a different weight. I had my winter coat that I wear to work if I can do without the down parka. A winter-weight jacket was on a different chair. That’s what I wear during my off-work outside time if I don’t need the parka or a coat that covers my hips. I had also pulled out my full-length raincoat with liner and my rain jacket with a liner, which I used once the rain settled down to a drizzle. Four coats in two days is a sign of a changing season if ever there was one. This morning before breakfast, before caffeine, my two dogs exploded out of what looked to me like a dead sleep and raced towards the glass door so fast that I held my breath, fearing they wouldn’t stop. They did stop, fortunately, barking violently. I assumed we were under attack by a pack of wolves or at least some army. What prompted this outrage? 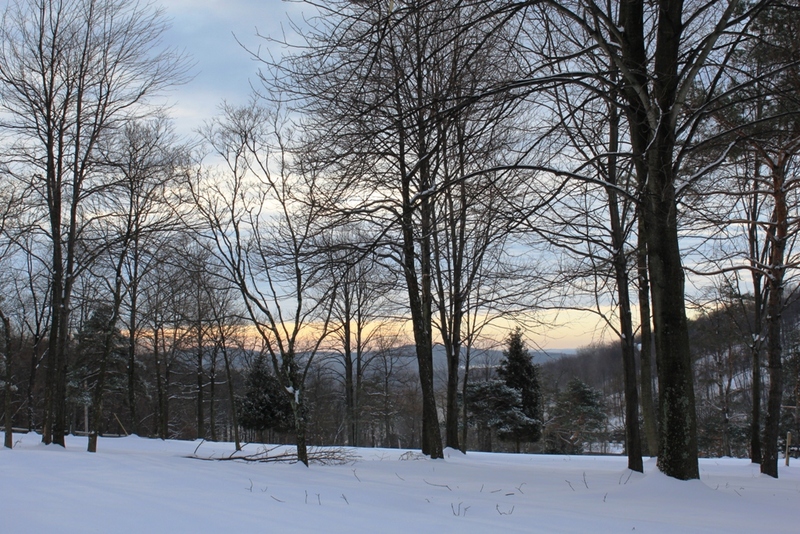 One of Roundtop’s people was not far behind the cabin, heading down the mountain on a snow machine, a red flag on a flexible pole floating overhead behind the seat. Likely, he was off to check a water line that brings water up the mountain to make snow or perhaps one of the pumps involved. No wolves, no aliens, no army. Just a man on a snow machine making tracks down the mountain. 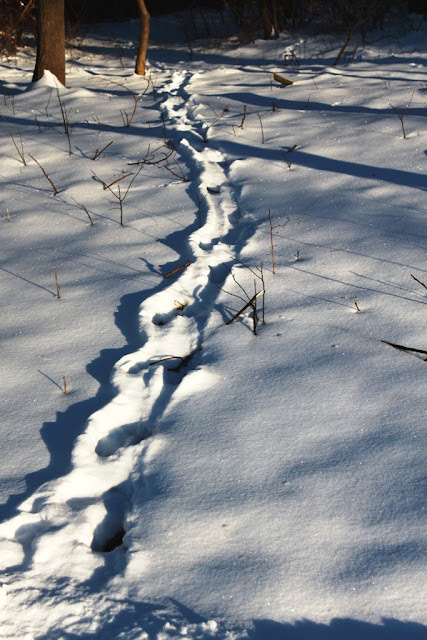 After a snow, everything that happens on the mountain is suddenly visible in the tracks that remain, even if I’m not there to see the event. I know birds, likely juncos, were hopping around within inches of the front of the chicken pen. Roundtop’s resident mouser walked down my driveway, checked the deck for a handout and then went under the cabin. The snow also lets me know what didn’t happen. I know, for example, that neither the raccoons nor the opossum cased the cabin’s perimeter last night. The woods around my cabin are still untracked by them. Two deer emerged from the forest out of a nearly invisible opening at the edge of the brushy woods, walked out into the open for 20 yards or so and then returned to the woods, probably disappointed they could find no grass to munch on. Tracks in the snow are like a calling card that tells me what’s going on around the cabin even when I’m not there. I like the certainty that knowledge reveals. Other seasons rarely allow that. A mud puddle may produce a track or two, but rarely a trail. 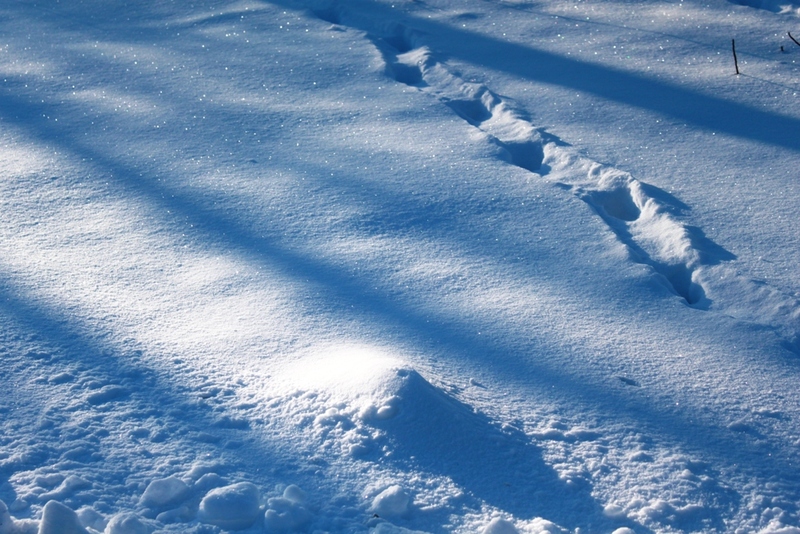 It’s only snow that tells the fuller story, the comings and goings of life around the forest. Winter’s determination is still strong. This morning I awake to about 7 inches of new, powdery snow and temperatures that are 50 degrees colder than last Friday. 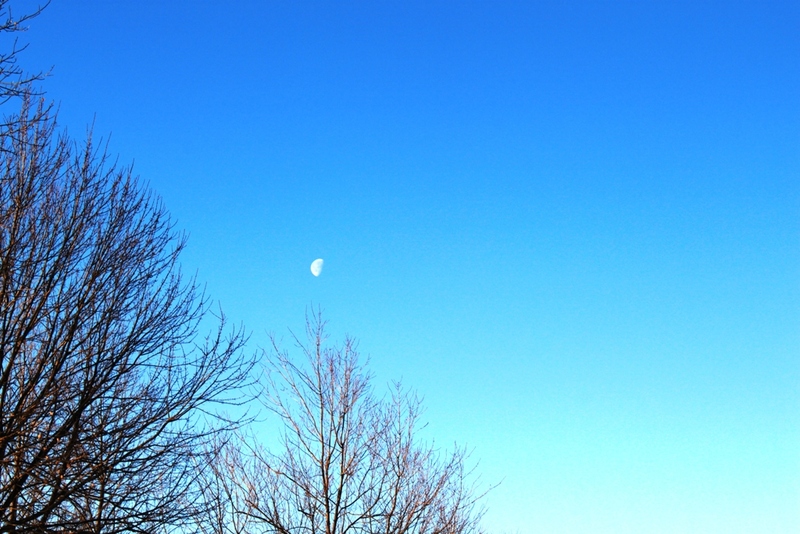 A few hours after I took these early morning photos, the sky cleared, and the day turned a bright, brilliant blue. I am up early, shoveling paths to the bird feeders and the chickens. The snow is just a tad too deep to broom away, but it’s a close call. A larger broom than I have and one with stiffer bristles might work just fine. The feeder birds are awaiting bird seed before I am properly dressed. While I shovel the deck, they call from the safety of the nearby trees, as though announcing that progress towards the arrival of their food is finally underway. Juncos sit on nearby branches, each apparently determined to be the first at the feeders whenever I retreat to the cabin. They aren’t willing to go the feeder before I leave the deck, but don’t want me out of their sight, as though they won’t wait even a single second once I am safely gone. The dogs, once again, turn into crazy hellions at the sight of the snow. What is it about snow that makes a dog forget its name, let alone any other words? Even the old dog, who is as smart as a whip, forgets (or ignores) everything I have ever taught him. Some other instinct holds him when it snows and that one doesn’t involve people. For me, the snow means a walk down the mountain to my car. I leave the cabin before the snow plows arrive, lugging my snow shovel and lunch. The walk is about a quarter of a mile, the morning quiet and still. 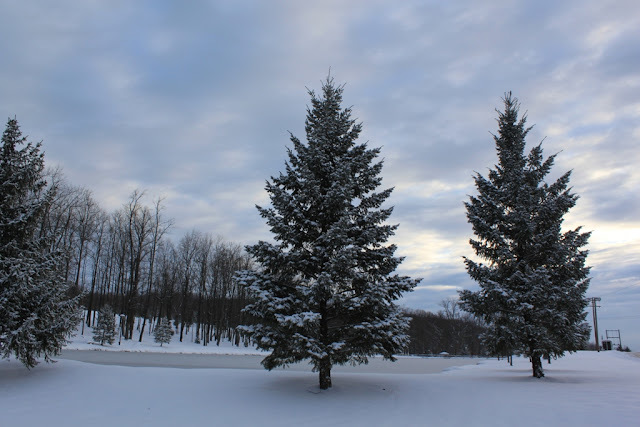 When I head out, the morning is still grey with clouds, the snow pretty much the same shade as the clouds. A snow morning walk is a pretty good way to start the day and I have no complaints. I’m finding it hard to return to my winter mindset after two days of record-breaking warmth. The snow melted and even the ice in my driveway disappeared. This morning I woke up to a trace of snow with 6 inches predicted for tonight, and the jolt that brought me is a lot worse than the forecast itself. Of course it’s still winter. Of course there’s lots of winter ahead. So it’s funny that a mere two warm days gets me in the mood for a different season. Two days of warm weather reminded me that it’s rather convenient to be able to go outside without spending 10 minutes getting suited up for it. Driving when there is no ice is alright, too. And now, the sun is setting later each evening. It’s still fairly light outside at 6 p.m. now It’s not light enough to, say, read a book, at that hour, but there’s enough light to walk around without stumbling and without needing a headlamp. I know it’s not just me. The cardinals have been singing up a storm. Ditto the bluebirds, the starlings and assorted other avian neighbors. For a day or so even my bird feeders were emptier, because the feeder birds and the world’s fattest squirrels found their own meals without benefit of me. But this morning reality returns. 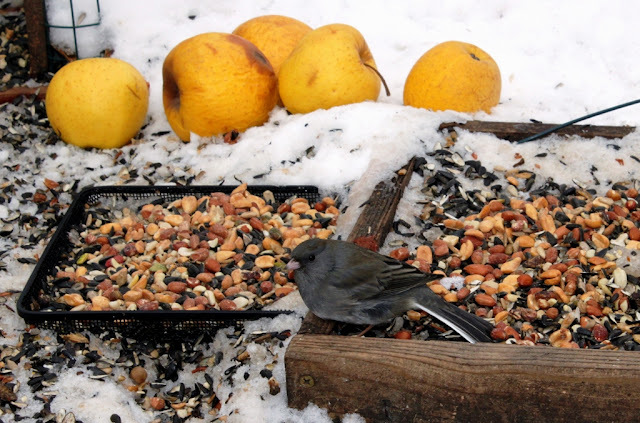 The titmice and juncos appeared at the feeders early this morning, picking among the few leftover seeds until I could get outside and refill their supply. Last year’s fawn was nibbling on the juniper bush again, and I didn’t hear the cardinal even once this morning. And tomorrow? Let's just say it’s a good thing I never did put those snowshoes away. This morning the birds are singing up a storm. The sky is nearly clear and bright, with only a few high clouds across the blue vastness. 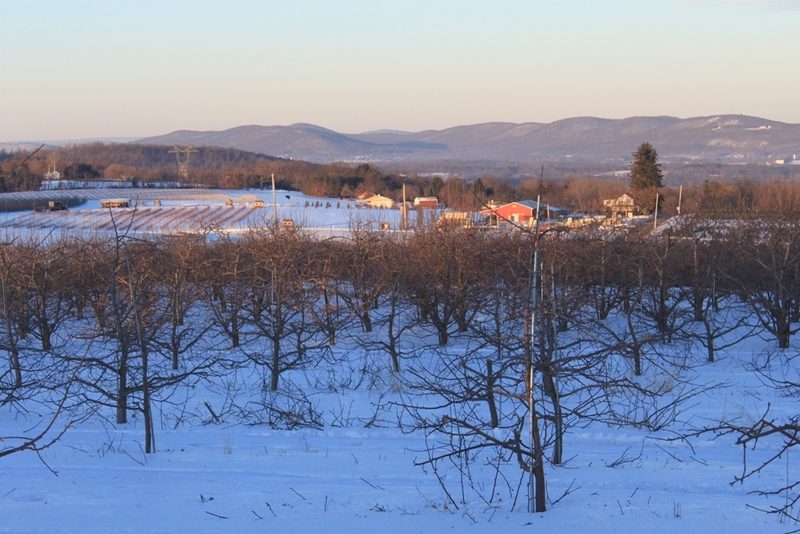 Seven local Canada geese, long missing from the iced-in top of Rountop Mtn. honked overhead this morning, though couldn’t yet find a place on the ponds where they could land. Even the ice in my driveway is diminishing, though not fast enough for me. Here atop the mountain the snow cover remains complete, if thinner than it was just two days ago. Snow cover is down to a few inches, perhaps several inches, but no longer is above my boots. Down off the mountain, the story is a different one. 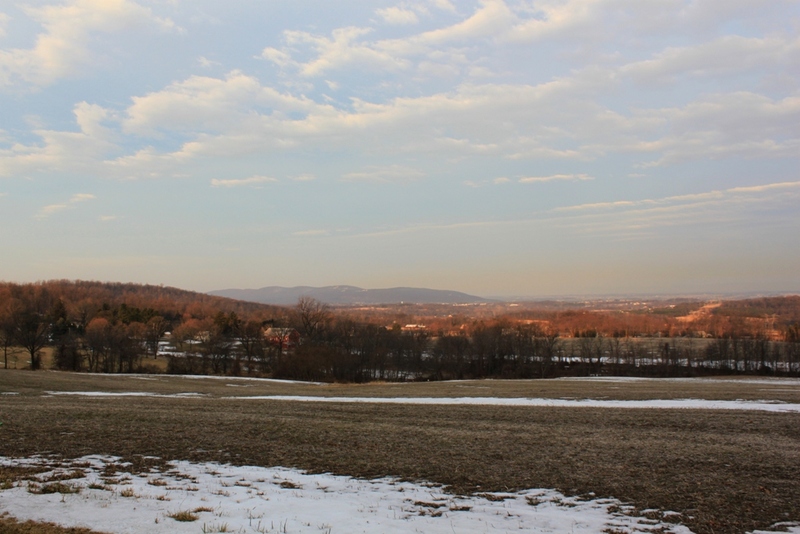 The snow is largely gone from the valley, gone off the fields, gone from the yards, revealing the earth for the first time in months. The fields are almost golden in the early morning light, soon fading to a duller winter brown as the sun rises towards noon. Down here snow remains in a few pockets, in the hidden spots, in a north-facing depression or under a brushy spot. The difference between the landscape I see down off the mountain and the one that surrounds my cabin is again a wide one. Down in the valley, I hear people talking of spring, as though that was just around the corner, perhaps even already here. For them perhaps it is. Up where I am, my mountain life sounds foreign to them, as though the physical distance between here and there is far enough to require a passport with a visa stamp, as though I speak another language. For them perhaps I do. I'm in the country of the cabin, where birds sing and geese honk, where snow stays long after it's gone elsewhere, where fields are the low country, where trees touch the sky. Can you think of another word that better applies to the lowly opossum? Last night Baby Dog started barking. She was using the same voice she uses when she tattles on misbehaving cats. I yelled at her to stop, to no avail. Eventually, I had to stop what I was doing and come downstairs to investigate. Instead of a cat doing something prohibited, I discovered an opossum out on the back deck by the bird feeder. “Great,” I thought, “a photo for tomorrow’s blog.” Then I remembered. My camera was still out in the car, and what were the odds the possum, faced with the constant barks of the dog, would still be there in the minute it would take to retrieve it? I decided to try anyway and rushed out to the car, sliding on the ice to grab the camera. When I got inside, the possum was still there. Still in the same spot. The exact same spot. Out I went onto the deck, camera in hand. The possum didn’t move. 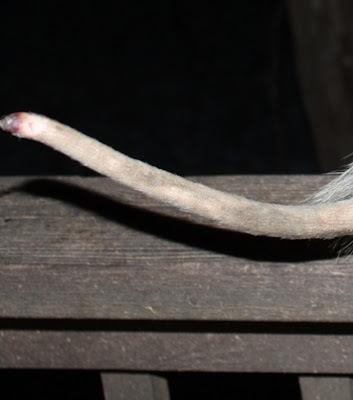 I quick took a photo, and then examined the possum in some detail. 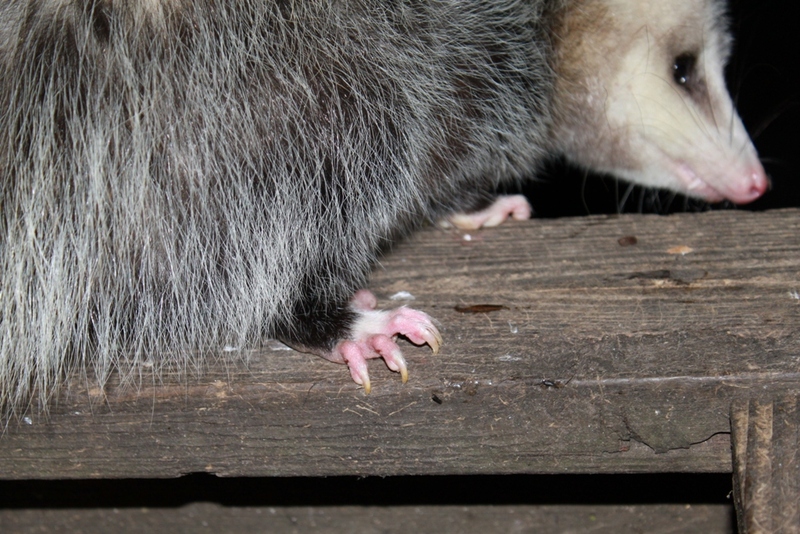 If possums have anything cute about them, and you do have to look to see this, it’s their cute, pink little feet. I touched the possum’s toes and took a photo. Just how does something this docile, this slow, this pathetic survive amidst daring and canny predators? Here’s my theory. Even bullies want to get a response from the objects of their terrorism. When the victim doesn’t do what the bully wants, doesn’t scream or cry or run or anything, even a bully loses interest. Is it possible that wild animals feel the same way about possums? There’s simply no “fun” in harassing a possum. You get more response from a snail. Eventually, after examining the possum’s tail in my hand and moving its toes one more time, I went back inside. I turned off the deck light, put the camera away and did the few dinner dishes. The possum was still there. Eventually it did sneak off, back into the forest. I don’t know how long it sat there before it moved. Even Baby Dog had lost interest by then. Then I saw that its tail was a bit funny-looking. The tip was damaged. Whether it was frostbitten or simply bitten, I couldn’t tell. The possum didn’t move. On Sunday, a thaw began to take hold on the mountain, the first since sometime back in December. 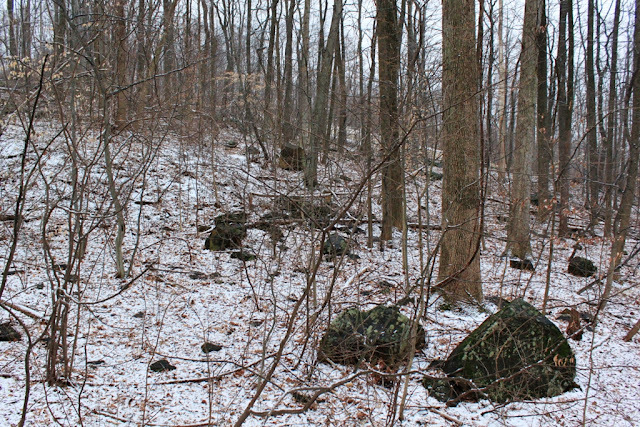 In a few places, such as the south-facing stony road cut of the lane up to my cabin, I can see a patch or two of bare ground. 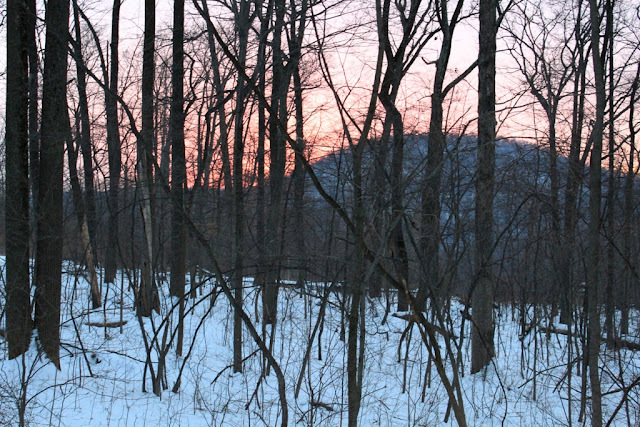 Elsewhere, snow still covers the forest. I checked its depth yesterday and found that instead of being just shy of knee-deep, where it lay for weeks, it is now just above my ankle-high boots. There is still quite a ways to go for it to disappear, but there’s been quite a bit of progress, too. …Except perhaps in my icy driveway. In fact, to me it appears as though the ice has disappeared everywhere but my driveway. Even there progress was made, though not as much as I expected, given the mid-40 degree temperature and the incredible amount of ice melt and grit I’ve thrown into it. I am even starting to be able to identify a few of the snow-covered bumps around my property—here a boulder, there a ceramic pot that I didn’t get inside before the snow fell. And like those slowly appearing mystery objects, I feel as though I am just beginning to dig my own way out of the icy depths of work—both at home and at the office—that has kept me buried since about December, as well. Like the mystery objects around the cabin, I am not “there” yet, but I am starting to feel there’s an end to it now, a time when I will see my way clear to the blue sky above and feel the warm sun on my face. 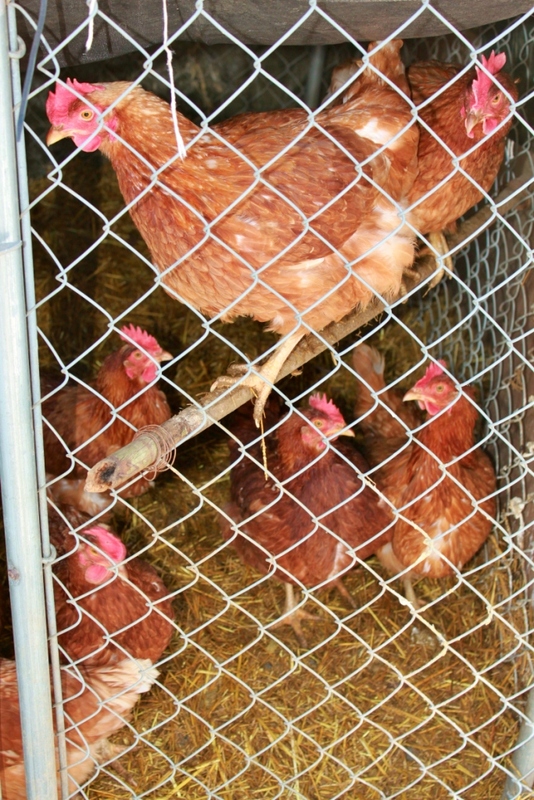 On Tuesday night my chicken pen was attacked and one of the chickens was killed. The predator coupldn't get inside, but grabbed the chicken and tried to pull her through the chain links. As soon as I (and the dogs) heard the commotion I rushed out, but it was already too late and she was dead. Last night the predator returned twice, but I was better prepared. I left a few lights on, so I wasn't stumbling in the dark. The headlamp was hanging from the bed post. The boots were by my bed. So I was outside even faster than before. This time the chickens were scared but weren't damaged. At first I suspected the fox, but now I think it was Pig the raccoon. Wednesday night I had to chase two raccoons, including Pig, off my decks at least 4-5 times. Mostly, they were in the bird feeders. Later in the evening an oppossum was the culprit in the bird feeders. The dogs are a big help. Baby Dog, especially, hears everything and isn't shy about reporting it with sustained barks. Tonight I found more plywood and another tarp to better protect the girls from the predicted 5 degrees for tonight and hopefully from the predator as well. Of course, if the chicken didn't sleep up against the fence, the predator couldn't have reached her, but chickens will do what chickens will do. I hope the predator soon tires of these attacks and that my increased protection and fireman-quick exits from the bed to the outside helps deter it. 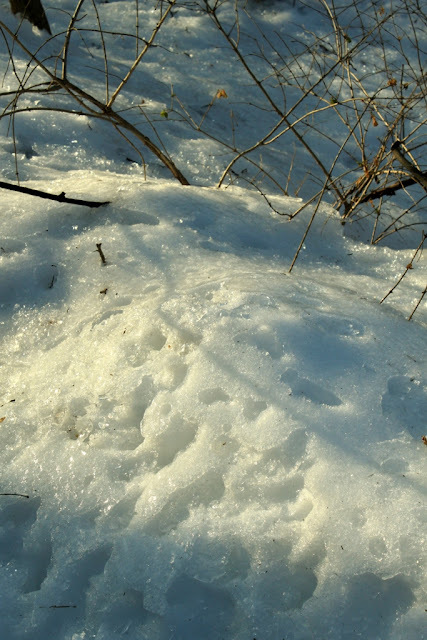 This has been a harsh winter, and I'm sure it's been tough on the wild animals that live in the forest around me. I'm not about to let my chickens pay the price for that, though. Despite that ice that still plagues my cabin, I am starting to get the sense that winter’s tightest grip is easing a bit. The first sunny sky in days and the first (if very briefly held) 40° reading on the thermometer were the reasons for that sense. Neither of those will last very long. Yesterday's sunny sky is already overcast, and today’s temperature, while happily above freezing by noon, seems stuck just above that mark so far today. I am not the only creature in my forest who seems to have noticed the improving weather, however. 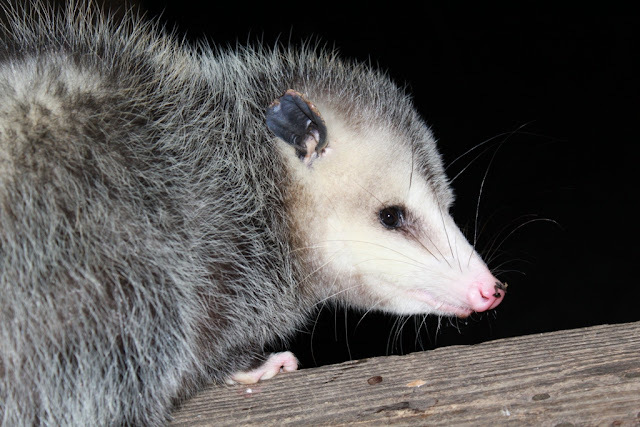 Last night an opossum appeared, skittering away as quickly as a ’possum can skitter on ice, much to the excitement of Dog. It’s the first one I’ve seen since around Thanksgiving or so. A raccoon, though not Pig, was also out the day before. And this morning I smelled skunk, another first in several months. Yesterday I looked in vain for a circling Turkey Vulture. They winter just to the south of me, and I often see them on the very first day with a warming trend in February. Too soon, I guess. Still, it’s signs like these that raise my spirits a bit or at least give me even a momentary respite from the ice and cold. I like winter, though when I think about it, my vision of a good winter is one with cold, sunny days and snow on the ground. Fog and gray clouds with ice underfoot is not part of that picture, so my enthusiasm for this year’s winter is less than it usually is. I don’t know that I’m yet to the point of wishing for spring, but I sure won’t mind being able to get out into the woods and walk around again. I haven't taken many photos these past several days. I haven't wanted to take the camera out onto the ice. Even with boot grippers, the ice is so bad that I slip while wearing them. I've tossed out more ice melt int he past two days than I've used in the previous two years. I found some "barn grip," which is really stones crushed slightly larger than sand, and used up 50 lbs of that. I still have ice. Today the temperature is finally above freezing here on the mountain, so the ice is lessening. Down off the mountain the roads are dry and ice-free. But when you look up at the mountains, you'll see ice hanging on to the last 100 feet before the top of the mountain. That's where I am. I am officially sick of ice, though in truth, it doesn't take much ice before I am sick of it, and I've had a lot more than just a bit of it this week. I shuffle around the cabin like an elderly old woman, trying not to fall, tossing out salt or crushed stones in front of each step. The chickens think I am scattering feed and rush to the edge of the pen in hopes of scoring something good. They have been much disappointed this week by that. Today (Sunday) is an improvement, with the sun actually breaking through and blue sky seen at least occasionally. Like a sun-starved flower I've put my face to it as much as possible, trying to soak up the winter-weakened rays. It's better than nothing, which is what I've seen for the past two weeks until today. Some winters are sunny ones, even during extreme cold. Not this one. 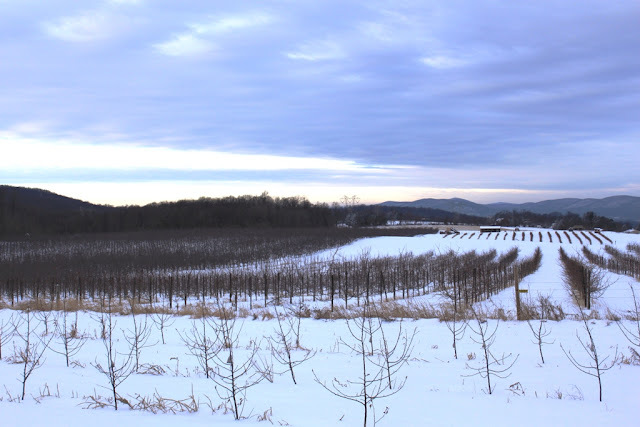 It's been cold and not-sunny for what I am remembering as the entire winter to date so far. That's probably not quite the case, but it sure is how I'm remembering it. I was awakened at 2:45 a.m. this morning by what sounded like the crashing of several china cabinets, followed soon after by a vibration that shook the entire cabin. An ice-covered tree hit the ground somewhere near the cabin. I didn’t sleep too much after that. When night lifted, I found more than .25 inch of ice covering everything. The evergreen trees are bent double, some touching the ground. 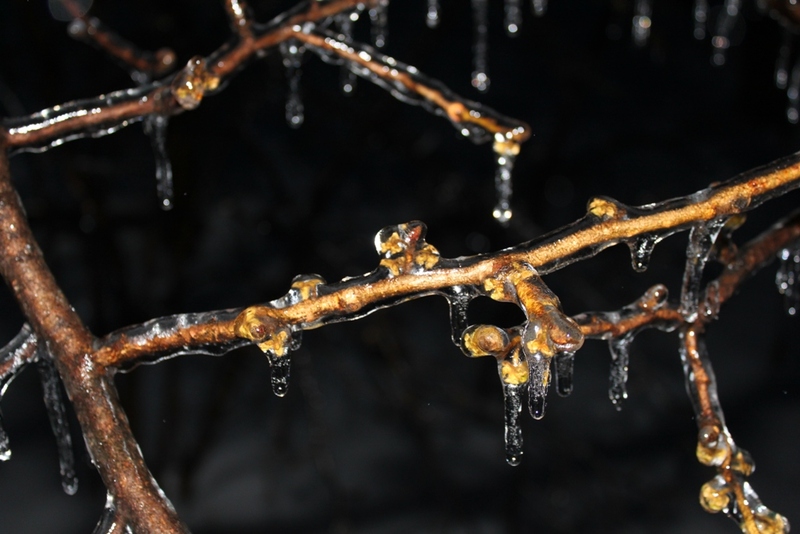 Every twig is encased in ice. The crashing china cabinet sound was a constant this morning, though was mostly branches hitting the ground, not entire trees. ﻿﻿﻿﻿﻿﻿﻿I spent a good hour cleaning off my car, then zig-zagged my way down the mountain, avoiding an obstacle course of downed trees and limbs. 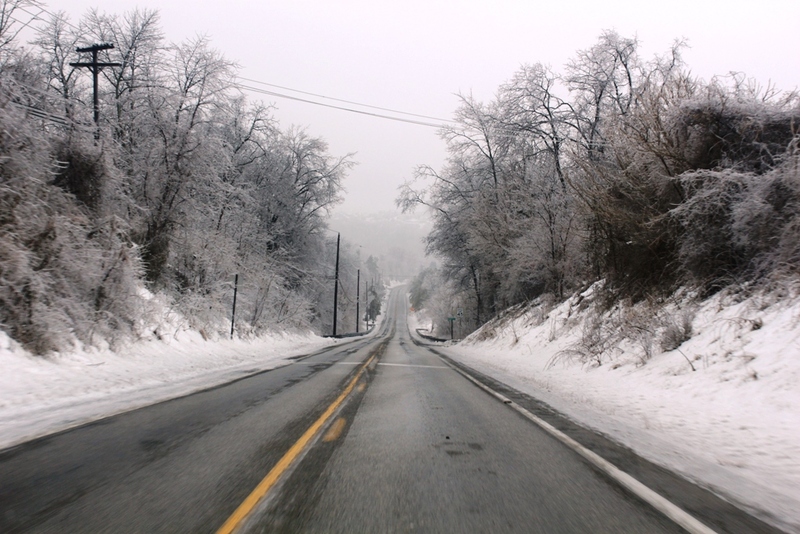 Once I reached the lower elevations, the roads were in decent shape, though ice covers everything there too. The drive to work--after the road conditions improved. I didn't dare stop to take photos during the drive down the mountain. I spent a good hour cleaning off my car, then zig-zagged my way down the mountain, avoiding an obstacle course of downed trees and limbs. Once I reached the lower elevations, the roads were in decent shape, though ice covers everything there too. This storm was very widespread in the eastern half of the U.S., and I imagine an entire legion of bloggers will be doing ice photos today. If you don’t want to see another ice photo, I will understand if you beg off today’s post. The storm is past my area now, though the danger may not yet be over. 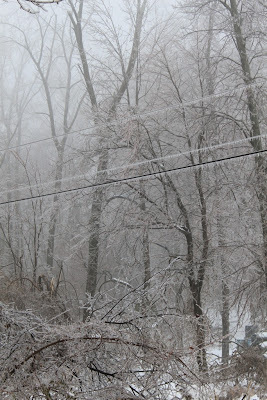 The forecast this afternoon is for strong wind, and if the ice doesn’t melt by the time that starts, the result can only be more power outages and downed trees. As ice storms go, this one is certainly the worst I’ve seen in several years and is right up there with the worst ever. After going a few years without one, the current day’s storm always seems as though it is the worst ever. The actual level of prior terribleness fades with the passing of years. Whatever is in my face at the moment is always the worst one ever. At the moment I am in “waiting on the ice storm” mode. 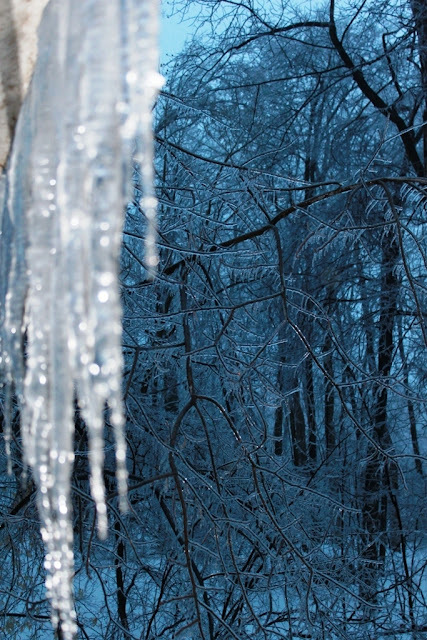 Ice storm is one of nature’s phenomenon that I would be happy to do without. Overnight, a fair amount of sleet fell, and perhaps a little snow, but the ice that is to come will be here sometime after dark today. I have spent a good bit of my time over the past 24 hours trying to get ready for the storm. Specifically, I am readying the cabin to be without electricity for a while, since that seems to be the usual result of an ice storm. For me, readying for that event means I make sure I have plenty of water available for me and the critters. I prefer to draw water ahead of time rather than break into my sealed, emergency water. The night before the storm I check my own food supplies and make sure I have enough food for the animals, too. I make sure the chickens are as far under the cabin as they can go and cover up the part of the pen that doesn’t fit. I charge up the cell phone. I fill up the car with gas, take a shower and wash my hair. Who knows how long it will be before power is restored if and when it goes out? In a storm as widespread as this one will be, power restoration to my cabin on the mountain is not going to be anyone’s highest priority. So now all of that is accomplished, and it’s a matter of settling in and hoping for the best. At my feeders today, the action has been nonstop. I’ve seen more of everything than I knew visited my feeders. That pair of cardinals? It turns out there are three pairs of them, plus an extra female. The shy mourning dove? Four of them. And so on. I’ve given up trying to count juncos. There are too many of them and they are never all sitting still at the same time. It looks like a scene from Hitchcock’s “The Birds” on my back deck right now. I can’t really see the sky anymore. It’s foggy here, or I am in the middle of a cloud. The forest grays out before I can see the sky or the mountain to the west or even my neighbor’s house. The icicles hang from the eaves, and the only color is the yellow of the apples at the bird feeder that were too far gone for me to eat. For the moment, there’s no ice. I guess I’ll have to take that as a good thing.